The thermal performance of window frames can easily be calculated using 2D numerical simulations. Several commercial software packages are available, and international standards provide a clear methodology to calculate the thermal transmittance. However, even though these methods are well known in academia and the research community in general, thermal optimization has not reached its full potential in the building industry yet and there is considerable margin for improvement. Abstract The thermal performance of window frames can easily be calculated using 2D numerical simulations. Several commercial software packages are available, and international standards provide a clear methodology to calculate the thermal transmittance. However, even though these methods are well known in academia and the research community in general, thermal optimization has not reached its full potential in the building industry yet and there is considerable margin for improvement. Specifically for small and medium size enterprises there is a lack of guidelines that are both generic enough to guarantee a wide-spread use, as well as specific enough to allow an easy and straightforward interpretation and implementation. In this research project, generic window sections were developed for vinyl, aluminium and wooden frames in collaboration with the building industry. Based on a market survey, typical approaches for improving the thermal performance for each type of window frame have been identified and described. Subsequently, the impact of separate improvements, as well as combined effects have been studied using both standardized and advanced calculation methods. For this, the heat transfer phenomena and the way these are modelled according to standard calculation procedures are discussed. Next to that, a number of secondary effect originating from standards are discussed, e.g. the thickness of the IGU, the depth of the window rebate, equivalent thermal conductivities and the impact of reduced heat transfer coefficients. Peer-review under responsibility of the CENTRO CONGRESSI INTERNAZIONALE SRL Nathan Van Den Bossche et al. / Energy Procedia 78 ( 2015 ) 2500 – 2505 2501 Throughout the last few decades there has been a growing interest in reducing the energy use in buildings. There are many aspects that contribute to the overall energy efficiency of a building, e.g. : an intelligent design, efficient HVAC systems, airtight interfaces and an appropriate insulation level. Particularly the performance of insulation has been investigated thoroughly in past studies. Despite a lot of research, one building component remains a source of concern, more specifically the window frame. It is a rather complex component due to specific boundary conditions relating to mechanical performance, operablility, acoustics etcetera. For walls, roofs and floors typical guidelinesfor maximum thermal transmittance in central to north-European countries are situated between 0.1 and 0.3 W.m²K, which can easily be realized with common construction types. For windows the guidelines are less strict, and typically vary between 0.8W/m²K and 2.4W/m²K. In some countries there are specific requirements on the IGU’s as well. Commercial double glazing with low-e coating and argon gas filling have a thermal transmittance of 1.1W/m²K, whereas triple glazing and vacuum glazing can go as low as 0.5W/m²K. To the knowledge of the authors, there are no specific restrictions in different countries on the thermal conductivity of the window frames. Note that imposing specific restrictions would render it impossible to construct some specific window configurations. For example, typical sliding windows and doors in aluminum or vinyl available on the marketplace have a thermal transmittance between 2.0 and 4.5W/m²K. Not because the thermal performance was not considered in the design process, but due to the practical restrictions in manufacturing and ease-of-use. The information on thermal optimization in scientific literature, and literature in general, is rather scarce [1-4]. Gustavsen et al. [1, 2] studied the impact of thermal conductivity of frame material and thermal breaks, to define material performance targets for currents window designs. Note that a U-value of 0.5 W/m²K was chosen as required performance level, simply based on the fact that the best commercial IGU’s on the market now have a U- value of 0.5W/m²K. Based on that approach, it was concluded that thermal breaks should have a thermal conductivity below 0.02W/mK (or 0.005 W/mK if ‘new’ materials are developed), structural insulating materials for wood composite profiles should have a thermal conductivity below 0.03W/mK, and ideally aluminum and PVC frames should comprise cavities with an emissivity below 0.05 for the surrounding materials. No design guidelines for window geometry were presented, and no pathways were specified on how to acquire the specified conductivities. Similarly, Byars and Arasteh  also focused on the impact of thermal conductivity on the U-value of the frame. Research by Gustavsen  indicated that although convection is modelled in EN ISO 10077-2  by adopting a simplified approach with equivalent thermal conductivities, results compare well with the fluid flow simulations. ISO 10077- 2 prescribes that cavities with an interconnection not exceeding 2mm are to be considered as separate. Any reference to papers or research is lacking for that assumption, and by means of CFD simulations it was shown that 7mm would be a more realistic criterion. 2. Models and simulation method An analysis of the characteristics of a range of window frames currently available on the Belgian market place resulted in the design of three different frame materials: aluminum, wood and vinyl. These are a neutral basis for simulations and can be used as generic models in order to avoid existing products being advantaged or disadvantaged. These models were designed in collaboration with the Belgian Construction and Certification Association BCCA) and the European Aluminum Centre, not only to guarantee the neutral design of the frames, but also to get a reliable overview of the typical measures that are taken to enhance the thermal performance of the frames. For the aluminum frames the current standard reference in Belgium is a 3 chamber profile with a thermal break in glass fiber reinforced polyamide. The system is made airtight and watertight by means of a central gasket, typically in combination with an interior gasket. Similarly, common vinyl window frames are composed of 5 chambers, and a steel profile is inserted to ensure an adequate strength and stiffness. Weathertightness is ensured by two gaskets as well, one at the interior plane, one at the exterior plane. The reference frame in wood has a thickness of 68mm, and is made out of hardwood and comprises an interior and central gasket. In collaboration with the BCCA a small round robin simulation exercise was initiated. Window frame manufacturers were invited to simulate the generic models and report the Uf-value according to the EN ISO 10077-2. Only 5 companies responded to the call, so the results cannot be considered representative for the complete Belgian building industry, but nonetheless a number of interesting conclusions were drawn. First of all, both Therm  and Bisco  were used and similar 2502 Nathan Van Den Bossche et al. / Energy Procedia 78 ( 2015 ) 2500 – 2505 results were found. Secondly, for the wooden frame the standard deviation was 0.00W/m²K, whereas a standard deviation of 0.01 W/m²K was found for the vinyl and aluminum frame. Evidently, conduction is the most important way of heat transfer in the wooden frame, whereas convection and radiation (and equivalent thermal conductivities) are more important in the other profiles. Fig. 1 Generic window frames in aluminium (left), vinyl (middle) and wood (right). The geometry of each model is based on the common denominator of commercial systems. These designs can be considered as basic, and perhaps not representative of the current building practice, but by using this approach it is more straightforward to evaluate and quantify the impact of different improvement strategies. The European standard EN ISO 10077-2 provides a numerical calculation method to calculate the U-value of the frame (Uf), which is typically done by using commercial 2D heat transfer program such as Therm or Bisco. For this analysis, Bisco was used but a more physically correct approach was adopted. The most important changes are the accurate calculation of the view factors and the non-linear radiation model (contrary to the use of equivalent thermal conductivity for cavities in EN ISO 10077-2) and the separated analysis of radiation and convection in cavities and at the internal and external surfaces. The EN ISO 10077-2 specifies that an average temperature of 10°C can be adopted for calculating the equivalent thermal conductivity. Simulations show that even in symmetrical frames the temperature dependent convection actually induces differences up to 0.003W/m²K in the models that are considered here (mind that in more extreme conditions where convection and radiation are more important, differences up to 0.04W/m²K were found). In general, this leads to slightly lower Uf-values, but allows a more correct evaluation of different optimization strategies. Using the more accurate simulation method, the Uf-value of the vinyl window frame is 2 % lower compared to the EN ISO 10077-2 calculation method, whereas for the wooden and aluminum window frames the Uf-value is almost 1%lower. In contrast, a bigger difference is recorded in the contribution of the three different forms of heat transfer (conduction, radiation and convection) to the overall thermal performance. Generally the EN ISO 10077-2 calculation method underestimates the importance of radiation and convection and overestimates the importance of conduction. Specifically for the wooden frame model the difference in the contribution of the forms of heat transfer between the EN ISO 10077-2 and more accurate method is striking This can be attributed to a redistribution of the different forms of heat transfer due to the underestimated importance of radiation and convection in the frame cavities. As the equivalent thermal conductivity of the cavities grows it approaches the conductivity of the wood. So a part of the heat flux that initially flowed through the wood now ‘chooses’ to cross the cavity by means of radiation, as the difference in heat flow resistance between the wood and the cavity has decreased. Finally, in the simulations the IGU is – in line with EN ISO 10077-2 – replaced by an insulation layer with the same thickness, and a thermal conductivity of 0.035W/mK. Given the fact that for calculation Uf-values that are not project-based (as is usually the case), it is not clear which glass thickness should be assumed. Table 1 shows the Ufvalues for the three reference frames, calculated for a glass thickness of 24 mm (double glazing 4-16-4) and 42mm (triple glazing 4-15-4-15-4). Nathan Van Den Bossche et al. / Energy Procedia 78 ( 2015 ) 2500 – 2505 2503 Table 1. Uf-values of generic window frames with glazing of 24mm and42mm. Uf-values double glazing 24mm (W/m²K) triple glazing 42mm (W/m²K) difference (W/m²K) difference (%) aluminum 2.773 2.618 0.155 5.59 wood 1.707 1.640 0.067 3.93 vinyl 1.503 1.451 0.052 3.46 3. Thermal optimization strategies Throughout the analysis of existing commercial window frames, a range of different thermal optimization strategies were found. A sensitivity analysis of the different optimization techniques was performed on the corresponding generic models. 3.1. Aluminum Table 2 reports the different optimization strategies applied to the aluminum window frame model with a thermal transmittance of 2.775 W/(m²K). The lowest achievable Uf -value by combining these strategies is 1.210 W/(m²K), a reduction in heat loss of 56%. Note that this should not be considered as the lowest achievable value. The analysis reported here focuses on the relative impact of separate and combined interventions, and by means of more focused specific optimisation even lower values can be achieved. Table 2. Optimization strategies for aluminium windowframes. Optimization strategies Uf-value (W/m²K) Improvement (%) start: model aluminum window frame 2.775 0 A. optimization width of aluminum profile members 2.759 1 B. thermal break (from λ=0,30 to λ=0,17W/mK) 2.624 5 C. extended thermal break (from 34 to 54mm) 2.660 4 D. dividing central gasket (depth cavities 6mm) 2.713 2 E1. dividing thermal break (depth cavities 6mm) 2.411 13 E2. insulation at thermal break (λ=0,035W/mK) 2.336 16 F1. extended glazing sealing to block radiation 2.570 7 F2. shifted glazing (from 15 to 30mm in glassrebate) 2.486 10 F3. 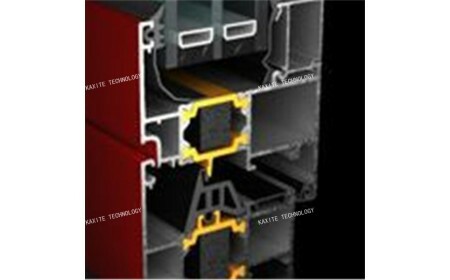 insulation between glazing & frame (λ=0,035W/mK) 2.475 11 G. untreated aluminum in cavities(ε=0,3) 2.499 10 H. Triple glazing 2.618 6 combination A+B+C+D+E1+F1 1.709 38 combination A+B+C+D+E1+F2 1.594 43 combination A+B+C+D+E1+F3 1.518 45 combination A+B+C+D+E2+F1 1.649 41 combination A+B+C+D+E2+F3 1.473 47 combination A+B+C+D+E2+F3+H 1.210 56 Some parts of a section can be improved in different ways. For example, to block radiation and lower convection the thermal break can be divided into different cavities, or the cavities between the thermal break can be filled with insulation material. The last option turns out to be the most effective one: an improvement of the Uf-value of 16% instead was obtained, whereas a reduction of 13% was evident when dividing the thermal break into separate cavities. Furthermore, the cavity between the IGU and frame can be treated in different ways. It can be divided in 2504 Nathan Van Den Bossche et al. / Energy Procedia 78 ( 2015 ) 2500 – 2505 separate cavities by extending the glazing gasket or by shifting the glazing deeper into the frame. However, filling this cavity with insulation appears to be the best option again. If this technique is applied, attention needs to be paid to prevent capillary water to penetrate into the secondary sealing of the IGU. By combining different optimization strategies, the cumulative effect is not equal to the sum of the separate improvement because some effects counteract. Figure 2. Simulation results for the optimized (top) and reference frames (bottom). The left figure shows the temperature distribution in the aluminum profiles, the middle figure shows the heat flux in each part of the aluminum frame, the right figure shows the heat flux in the vinyl frames. 3.2. 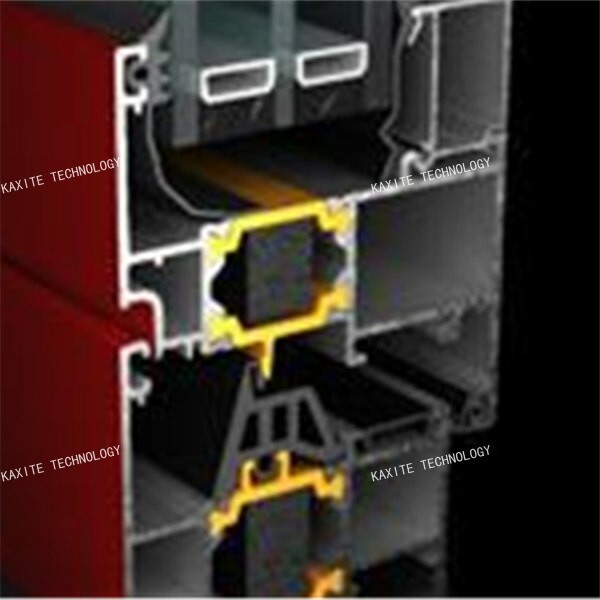 Vinyl The Uf-value of the reference model of the vinyl window frame is 1.503 W/m²K. It is possible to reduce it to 0.759 W/m²K or a reduction of 50% by choosing the right combination of optimization techniques. The weak point of a standard vinyl window frame is the steel reinforcement. There are two typical methodologies to tackle this problem: either replace the reinforcement by a better insulating material with comparative strength or replace the frame material by a stronger material by which the reinforcement becomes redundant. For the first option two materials are proposed: stainless steel and a composite material. Stainless steel performs hardly better than steel, a composite reinforcement (λ=0.2 W/mK) on the other hand really makes a difference. Moreover if the whole frame would be made of a strong composite (e.g. with glass fiber; λ=0.2 W/mK), no reinforcement is needed, the result almost approaches that of the vinyl frame with composite reinforcement. However, if in the central cavities are insulated, the composite frames achieve a better performance compared to the reinforced frames. Dividing the frame into more cavities of deepen the section render ineffectively. Deepening the frame from 90mm to 120mm and insulating it reduces the heat loss by 29%. Installing a central gasket reduces the heat loss by 4%, insulation between IGU and frame by 3%, using a composite material to eliminate the steel reinforcement renders a 11% reduction. 3.3. Wood The recent evolution to apply wooden frames in low-energy buildings is a sign that particularly wooden frames Nathan Van Den Bossche et al. / Energy Procedia 78 ( 2015 ) 2500 – 2505 2505 have potential to have a low thermal transmittance. Thereby the thermal performances of the IGU should be balanced with the performance of the frame. Consequently the reference model on which the different optimization techniques are applied has triple glazing. Aluminum windows on the other hand, are typically chosen based on their cost effectiveness, durability and the generally require minimal maintenance. However, as aluminum frames are widely used, improving the frame has important consequences. Soft wood is a better insulator than hard wood, but it is less durable and possibly susceptible to premature deterioration. This is why the reference model is made out of hard wood, but when properly shielded from the environment, soft wood is used. The reference frame has an Ufvalue of 1.640W/m²K and by combining the appropriate techniques, an Uf-value of 0.584 can be obtained. This is an improvement of 64%. Three optimization techniques with regards to the wooden volume of the frame are compared. The best technique is to replace three layers of hard wood by cork, PU and again cork. Another approach, albeit less successful, is to replace one rectangular part of the central mass by cork. The third option is to make small holes in the frame without reducing its strength. In order to shield the wooden frame from the exterior environment an aluminum or an insulated synthetic screening can be used. Both screenings offer good results that stem from the replacement of hard wood by soft wood that insulates better. Deepening the frame from 68mm to 108mm decreases the Uf-value from 1.640 to 1.269W/m²K. Replacing the hardwood material by a wood-cork-pu-cork-wood combination reduces the heat loss by 47%. Note that inserting small air cavities (4mm high by 14mm wide) into the solid wood material may affect the durability, and a volume of 16% cavities only reduces the heat loss by 9%. Finally, inserting insulation between the IGU and the frame has a much smaller impact compared to the other profiles (1%). Contrary to the other profiles, the glazing stop already has an insulating effect, causing the additional insulation to be less effective. 4. Conclusions and discussion The simulation results of the generic models of window frames show that an average window frame can be improved by 50% up to 64% with straightforward optimisation strategies found on the Belgian marketplace. The new simulation methodology proves its value as some techniques turn out to be more effective or gain an optimum under other conditions than the old methodology assumed. Furthermore, new insights rose from the analysis. Some interventions do not reach an optimum based on heat transmittance alone: e.g. theoretically depth of the wooden window frame could be increased endlessly to minimize the heat loss. An intelligent design should find an optimal equilibrium between thermal performance, a restricted use of material and other practical restrictions. For hollow frames like the vinyl and aluminum model the positive effect of increasing the depth of the IGU in the frame can be examined. Perhaps another option would be to structurally bond the IGU to the frame over the total width of the frame, so the structural function of the frame is partially transferred to the IGU. Because of the significant influence of aluminum on the heat transmittance of the frame due to the high thermal conductance, further research on reducing the emissivity of materials might lead to a substantial reduction in heat transfer by radiation. References  A. Gustavsen, D. Arasteh, B. P. Jelle, C. Curcija, C. Kohler, Developing low-conductance window frames: capabilities and limitations of current window heat transfer design tools - State-of-the-art review, Journal of building physics, Vol. 32 (2) (2008), pp.131-153. A. Gustavsen, S. Grynning, D. Arasteh, B. Petter Jelle, H. Goudey, Key elements of and material performance targets for highly insulating window frames. F. Asdrubali, G. Baldinelli, F. Bianchi, Influence of cavities geometric and emissivity properties on the overall thermal performance of aluminum frames for windows. Energy andBuildings  U. Larsson, B. Moshfegh, M. Sandberg, Thermal analysis of super insulated windows (numerical and experimental investigations), Energy and Buildings, Vol. 29 (1999), pp. 121-128  N. Byars, D. Arasteh, Design options for low-conductivity window frames. Solar Energy Materials and Solar Cells 25 (1992) 143-148. EN ISO 10077-2, Thermal performance of windows, doors and shutters - Calculation of thermal transmittance Part 2: Numerical method for frames, 2012. Therm 6.3 NFRC Simulation Manual, Lawrence Berkeley National Laboratory, 2013. Bisco 10.0w. User Manual, Physibel, 2012.